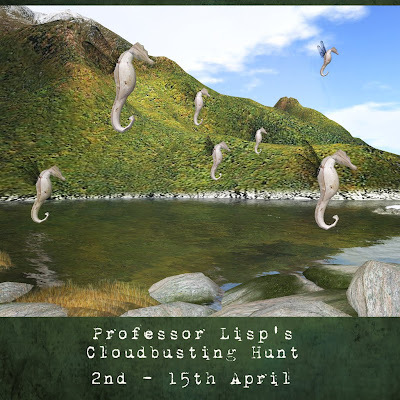 Quick post to mention that the new LISP Sim is having a mini hunt to celebrate opening. 4 stores are taking part - LISP Bazaar, *Art Dummy!, Urbanized and BangBang! with 5 sets available. "Professor Lisp is preparing to build a cloudbusting machine, but he is not getting very far. He is in need of as many clouds as he can get his hands on. Can you help him in his quest by collecting the clouds?" (click the hunt notice in the shop entrance to start! ).